This recipe originally was posted at http://www.thekitchn.com and was used as the dry rub for our oven cooked ribs at the March/April 2017 Birthday Party in Cedar Valley. We actually did 1/2 of the recipe for our needs of 3 racks of ribs and still had leftover. Since there’s no oven or complicated procedure involved in the making of this rub, the assembly of everything is key. Forgetting one ingredient can make things taste a little off, so make sure everyone (spice wise rather) is in attendance! Measure ingredients into prep bowls. We usually mix them into smaller bowls before adding them to the large bowl, just in case we measure incorrectly it’s easier to rectify. Add all spices to your large bowl and add brown sugar. Combine with a whisk, or toss all ingredients into a large zip top bag and shake, shake, shake! Rub your mixture into the piece of meat which you’ll be using. We suggest this rub on anything that once had legs. Don’t be afraid of it getting messy, that’s a given, just get it in all nooks and crannies including bony or fatty parts. Wrap your meat in plastic for at least an hour, up to a day and let things mingle. 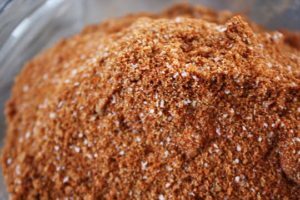 Although you can grill, broil or bake things immediately, the longer the rub sits on the meat the more flavor will develop further into it. This can keep up to 72 hours if needs be, but is best right around the 24 hour mark! Enjoy! There are as many dry rubs out there as there are hairs on your head. This is just a base mixture to get you started. If you like different things, feel free to adjust it to suit your tastes. You can also play around with the types of sugar in the mixture combining brown, white, turbinado and more!